Actual birth data, from real pregnant women, shows that the due date is not only an imprecise delivery estimate–as any single day would be–it is 1-4 days too early. Statistically-speaking, it is biased. And bias is bad. So why care about the due date at all? Well, modern medicine has given us one very concrete reason for concern: Due dates act as a medical deadline. Go a week past yours, and you will be urged to have labor induced. Go two weeks past and an induction is all but assured. If you have severe gestational diabetes, and your due date will likely be treated as a hard stop, and your doctor will insist on an induction at the 40 week mark. So what IS a due date? The “due date” comes from a calculation known as Naegele’s rule, in which 280 days are added to the first day of a woman’s last menstrual period. Naegele’s rule has proved remarkably enduring. Naegele, a director at a German hospital, developed his rule in the early 1800s, long before ovulation predictor kits, over-the-counter pregnancy tests, prenatal ultrasounds, fetal nonstress tests, pitocin–in short, before all of modern obstetrics. His calculation of pregnancy length relied not only on the duration of actual, observable pregnancies, but was also greatly influenced by biblical scholarship indicating that the gestation of Christ lasted for ten lunar months. Not surprisingly, Naegele’s rule has some problems. The first, imprecision, is pretty obvious to people with ovaries: His rule assumes menstrual cycles are consistent in length, exactly 28 days long, with ovulation occurring precisely on day 14. Ovulation is less predictable than that. And many, many women’s cycles are shorter or longer than 28 days. Have a longer cycle, and the due date will likely underestimate the real delivery date. Have a shorter cycle, and the due date may overestimate it. Other large studies back up these findings: Naegele’s rule consistently underestimates the average delivery date by 2-4 days (see here). Note, though, that estimates apply best to Caucasian women. For unknown reasons, women of Asian or African ancestry tend to give birth about a full week earlier than do Caucasians. Is there a more accurate way to calculate a “due date”? Yes. One way is to shift Naegele’s rule. Adding 282 days to the first day of the last menstrual period, instead of 280, provides a more accurate estimate. But, if available, an estimate based on a first trimester ultrasound is the best option. Using ultrasound-based due dates, 92% of pregnancies delivered within the normal range of 37-42 weeks; using due dates, this percentage fell to 87%. One day off. Two days off. Who really cares? Actually, this bias matters a lot. An estimate off by even a couple of days significantly raises the percentage of women regarded as post-term (past 42 weeks), who are then urged to have inductions. Consider the results of a UK study of over 24,000 women. The researchers studied inductions for post-term (past 42 week) pregnancies. When evaluated by ultrasound dates alone, they found the majority, 71.5% percent, of these pregnancies were not actually post-term. So when are pregnant women actually most likely to deliver? In her book Expecting Better, Emily Oster used the 2006 annual U.S. data for singleton births, from the Centers for Disease Control, to try to answer this question. She noted that in 2006 the most common week to deliver in was the 39th; about 30% of births occurred then. The data from 2012 look similar to those from 2006, but hint: there’s a problem with her approach. What’s the problem? These data are fine for figuring out when a pregnant woman is most likely to deliver, assuming she is agnostic about how she delivers. But they are not particularly useful for figuring out when spontaneous labor is most likely. This is because the CDC birth data includes all deliveries. The CDC combines spontaneous births with scheduled inductions and c-sections, and these are typically scheduled for the 39th week of pregnancy. Are there really enough scheduled inductions and c-sections to affect the distribution of births for the whole U.S.? Absolutely. Since 1990, the rate of medical inductions has more than doubled. In 2012, more than 1 in 5 pregnant women were induced, compared to just under 1 in 10 in 1990. In 2012, 32.9% of women had c-sections, a 60% increase from 1996, and about half of these c-sections were scheduled. 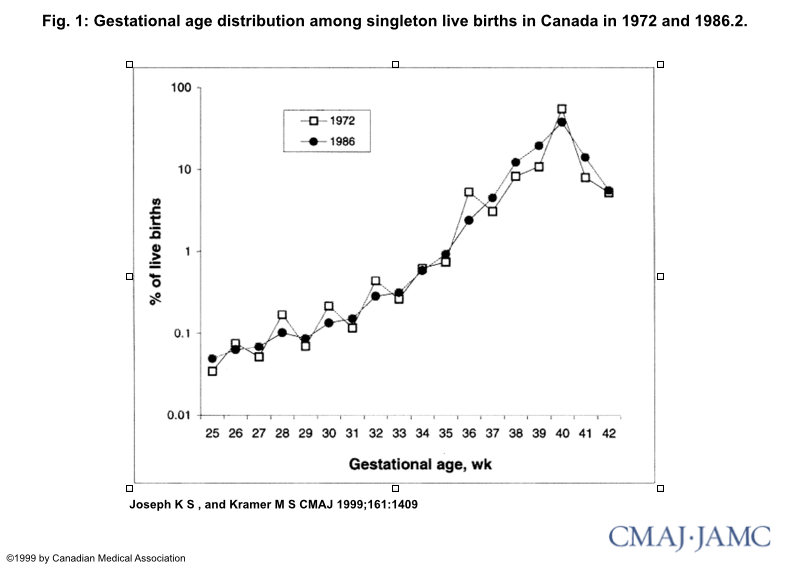 Scheduled inductions and c-sections shift the bulk of the distribution to the left. In 1990, slightly more women delivered in their 40th week of pregnancy than in their 39th week, and about 10% made it to their 42nd week. In 2012, most women delivered in their 39th week, and only 5% delivered in their 42nd week. Now that I am full term, how likely is it that I will deliver in the next week? As a full-term pregnant woman, the above graph did not address my central question: when was someone like me most likely go into labor? Predicting this using the average delivery day, while a superior approach to using the due date, is still suboptimal. This is because the distribution of births is skewed. In 2012, preterm births accounted for just under 12% of all U.S. births. These preterm births create a long tail that pulls the average delivery date to the left. Moreover, by 37 weeks, I knew I was not going to deliver in my 35th week. It would be nice to update my delivery estimate with that knowledge. Boiled down to a simple question, what I wanted to know was: How likely am I to go into labor within the next week, considering that I have not yet given birth? Statisticians would call this the conditional probability of giving birth in a given week. For the sake of comparison, the table below shows the conditional probabilities for 1990 and 2012. *Note: the CDC data combine week 37-38 deliveries. The probabilities shown for week 37 are therefore for delivery over the next two weeks. Until past the 40-week mark, the odds of labor in the next week are less than 50%. Because it is standard medical practice to induce labor at 42 completed weeks, the chance of delivery by 42 weeks appears to be 100%. Of course, many of these births are not spontaneous, but induced. From historical data, it appears that without medical intervention 5-10% of women would deliver after 42 weeks. Nice that your doctor was relaxed and respectful of your wishes! Did you baby end up over 9 lbs at birth? It sounds like weight estimation using ultrasounds can be pretty inaccurate. They estimated 9 lbs 3 oz and he was 9 lbs 7 oz two days later when he was born. I think the accuracy probably depends a lot on the experience of the technician and quality of the machine. My due dates were calculated by last menstrual period; my firstborn was 10 days ‘early’ and my seconnd was nearly two weekes ‘late’. Were you bummed when the second one went two weeks late after the first coming early? The key here is that the above statement is true if labor is imminent. If it is say, a week away, then having an induction lowers the risk of a c-section. After reading through all the research on this, the one take home message seems to be that after 41 weeks, having an induction is not going to raise your chances of a c-section; it will almost certainly lower it. Why would a c section be higher after 41 weeks? Could you do (or have you already done) a review of the data on inducing labor in “elderly women” to prevent stillbirths? I am 41 years old and pregnant with my 4th child. I know the apparent standard practice is to induce at 39 weeks based on data from small study where is it suggested that stillbirth risk is that of younger women at that time. I’m vehemently opposed to the idea. I have had one experience with oxytocin after 2 completely unmedicated births and it was human torture. I am a physician in a non-OB field. In my perfunctory review of some data, I think there is excessive medicalization and intervention in birthing. Thank you. Great idea–I am going to add it to my queue. I did not know that this was standard practice. Would you send me any info you have about this being standard and the alleged rationale? Another question I’d love to know… How do these stats change based on your previous children. For example: my son (healthy, normal pregnancy) came three weeks before his “due date.” So early no matter how you look at it really. What are my chances of having another early baby – are they increased at all? (Assuming another healthy pregancy, of course). Hi, just want to add to this terrific post that in both France and Germany (where I’ve had prenatal appointments) the due date is calculated to be a week and two weeks later, respectively, than in the US (where I’m based). I wonder whether in Asian / African countries the standard calculation is also different, to reflect the earlier delivery cited in the study you linked to above? (Also, since that study was based in London, sampling women of African or Asian *descent*, I wonder whether there’s a difference between African / Asian women actually in African / Asian countries and those in Caucasian-majority countries?) Thanks again for your intriguing discoveries and discussions! I’m the exception to the rule not to count on the due date being the delivery date. My two vaginal births occurred on their due dates. with #1, my water broke the day before my due date and I was induced the next morning and delivered in the evening. With #3, I went into natural labor at home in the morning at about 9 am, arrived at the hospital at 6cm at about 1 p.m and delivered at the hospital at 2:46 (weirdly enough on the operating table as they were preparing to put me out for an emergency c-section due to fetal distress when I said “the baby is coming” and then checked and then told me to push, it turned out he had a true knot in his umbilical cord and the cord was wrapped twice around his neck). I know with my first pregnancy that I had a standard 25 day cycle and ovulated on day ten, with a positive pregnancy test 10 days later, so if the doctor had gone by those dates, my son would have been late under Naegele’s rule. With #3 I ovulated around day 13, so had a more typical cycle length. I had my first baby ten days late, and he weighed 6 -10. My second was 26 days late (!) and weighed 7 – 4. The third was a csection around her due date, and she weighed 6 – 3 and they said she looked three or four weeks early. Go figure. My first grandchild is due tomorrow (son of the son who was 26 days late), but who knows! What a great article. I needed this ammunition in order to sound informed as my doctor wants to induce me at 41 weeks. I’m considering it since there are risks such as meconium etc. However I’d rather base it on evidence and if my fluid levels and stress tests are normal I see no reason to wait until 42 weeks. My mom had both my sister and I “late” so there is that genetic factor. My blood pressure has been rising a bit albeit still normal, so I just have to control that by exercising daily and a good diet. I gave birth by emergency C section after the most painful back labor ever! My son was two weeks late according to my due date. First Dr told me Oct. 31. Switched doctors early on, next one told me Nov.2. MATURE! At 9 lbs. 12 Oz. My daughter was by scheduled C section at 10 1/2 lbs. I meant it PROVES lateness!